Blondie and Brownie: Roast Strawberries. Make Gelato. As part of our book musings way back when, Brownie thought of the GelOtto Cart having had said gelato many times during her undergraduate career on the campus of the esteemed New York University. As a New Yorker that avoided Washington Square like the plague (I'm more of a Tompkins Square kind of gal), I could not speak to said gelato. Regardless when the lovely Meredith Kurtzman said she's game to being included in New York a la Cart, we were both beyond psyched. Last week was the small shoot at the GelOtto Cart and obviously I had to get gelato. What kind of person do you think I am? 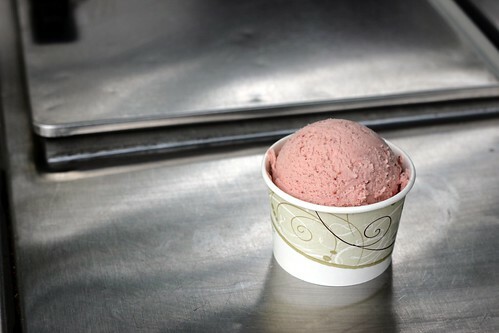 During the shoot, a trio of tourists rolled up, each one getting the same flavor: roasted strawberry. Meredith and I discussed the type of berries that worked best, how hard the flavor is to make causing it to only be made in small batches, and how early the strawberry season really was this year. And then I got some gelato. If all you've ever had is artificial flavored pink strawberry-esque cream, I highly recommend heading down for this before it runs out. It has the most precious, summertime flavor of a fresh ripe strawberry--the small kind that are full of goodness, not the plump watery ones--made into creamy gelato. Donny only got one spoonful, he wasn't allowed any more. I don't know how you've resisted this. The GelOtto cart's been out for years. Go Shop at Whole Foods! It's Almost The Treats Truck's Birthday!